The most beautiful person of the year is headed to the jungle. Lupita Nyong'o, fresh off of her Oscar-winning turn in "12 Years a Slave," as well as being named People magazine's most beautiful person of 2014, has scored a role in "The Jungle Book," director Jon Favreau's upcoming adaptation of the Rudyard Kipling tale. Scarlett Johansson, currently filming "The Avengers: Age of Ultron," has also joined the movie. According to The Hollywood Reporter, Nyong'o will play Rakcha, a mother wolf who adopts a young human boy named Mowgli. Johansson, meanwhile, will provide the voice of Kaa, a python who hypnotizes and eats other animals. Kaa is the second villain of the film, following the ferocious tiger Shere Khan, voiced by Idris Elba. The part of Mowgli has yet to be cast. It's worth noting that "Jungle Book" marks a reunion between Favreau and Johansson, who previously worked together on "Iron Man 2." Elba, of course, has Marvel experience of his own, having played the watchful Asgardian warrior Heimdall in both "Thor" movies. Will we see more Marvel movie veterans join the "Jungle Book" cast? Robert Downey Jr. as Baloo the bear, perhaps? Samuel L. Jackson as King Louie? And here's some fun food for thought: do you think that maybe, just maybe, by being around so many Marvel Cinematic Universe alums, Nyong'o herself could wind up getting in on the superhero action some day? There's already a petition circulating to see Nyong'o as the new Storm of the "X-Men" movies, but those films are owned by Fox. How about seeing Nyong'o in the lead role of "Black Panther"? Traditionally, it's Wakanda king T'Challa under the mask. But why not sub him out for Shuri, pictured above? 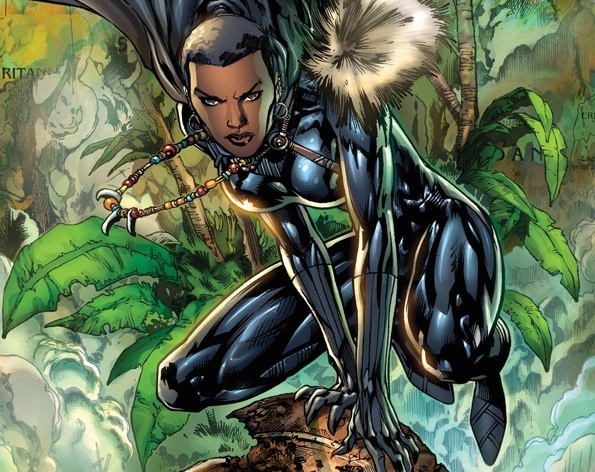 Shuri is T'Challa's sister, and she once adopted the Black Panther moniker and powers when her brother was injured. Why not have her as the star of the film, with Nyong'o in the role? We can certainly dream. Besides, she might be too busy to accept a Marvel mission, even if it's offered. Not only is Nyong'o starring in "The Jungle Book," she's also been rumored for a role in "Star Wars: Episode VII." We have yet to see how that rumor pans out. So, to recap, Nyong'o's 2014 includes an Academy Award, a part in "The Jungle Book," a possible part in the new "Star Wars" series, and the label of most beautiful person of the year. Not a bad start to 2014 for one of the movie scene's most promising new stars — and the year isn't even half over. "The Jungle Book" opens on October 9, 2015.